Over the course of time, we have become good friends with some Indian chefs who have taught us skills that we cannot ignore. Indian cuisine is rather complicated, and we are proud of ourselves for offering it. Paddy’s Pride is our Curry Club menu, featuring homemade Indian dishes. Now, you may ask what curries have to do with an Irish pub. Well, the relationship is fairly logical, because India’s culinary culture has spread throughout the world. The history of the cuisine is at least 6,000 years old, and even today it is one of the most enjoyable cuisines in the world, what with its diversity, aromas and flavours. We at Paddy Whelan’s have tested lots of Indian recipes to offer to our guests. The new Curry Club menu features all of the dishes which our guests selected in a special vote. When guests who organise special and private events ask for very specific and traditional dishes, we ask our Indian friends to come and help us in the kitchen so as to ensure total success. A cone-shaped clay oven fired with natural and high-quality coal – that is the tandoori, and it is closely identified with Indian cuisine. 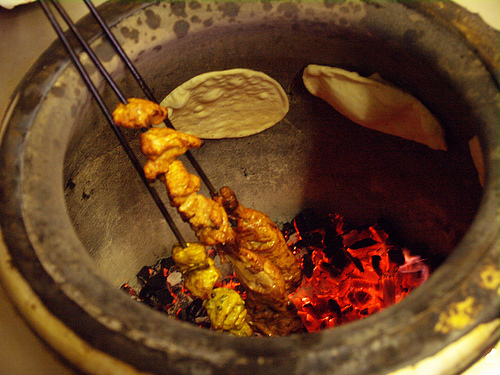 Marinated chicken, lamb or fish are placed on long steel skewers and inserted in the tandoori oven to cook. Naan bread is also prepared in the oven. Round circles of dough are thrown at the inner walls of the oven, where they get stuck and bake. When the dough is lightly toasted, the naan is ready to be served. Paddy Whelan’s is proud to be one of the pubs in Latvia to serve all tandoori, tikka and naan dishes from an authentic tandoori oven. Curry sauce* – what’s that? Curry sauce is the most typical sauce in Indian cuisine – thick, with distinct taste and a rich aroma, always prepared from herbs and Indian spices. Masala sauce** – what’s that? Popular all around the world, masala sauce is made of vegetables, yoghurt and a wide selection of Indian spices. Madras sauce*** – what’s that? Those who love fiery dishes will be delighted with madras sauce, which is dominated by Indian chili peppers, with coconut chips, tomatoes, herbs and a selection of Indian spices. VERY, VERY SPICY! Raita is a sauce made of yoghurt and Indian spices that can accompany almost any Indian dish. Naan is bread made of gram flour and baked in a tandoori oven. It can be plain or stuffed with garlic, cheese, etc. All of our foods are prepared with top-quality ingredients. We do not have any service fees, and it’s up to you to decide on a tip for your waiter.